While America remains the birthplace of Rock, the British refined it and in the view of some, improved it to create what we know today as UK Classic Rock. The 60’s, 70’s and 80’s represent the golden age of this genre, exemplified by legends such as The Rolling Stones, The Who and The Beatles. 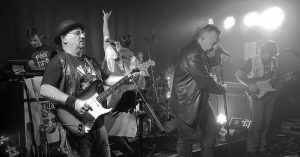 The UK Classic Rock Show aims to reproduce the music from this era, performing hits from all of the above as well as Queen, David Bowie, Deep Purple and the great Led Zeppelin. Before they perform at Southport Sharks, we got to know the band a little better. What is it about UK Classic Rock that you love? That’s easy, there’s nothing better than British Rock! It’s the birthplace of The Beatles, The Stones and Led Zeppelin. Three of the most influential bands in history. Describe the UK Classic Rock Show in three words! How do you think UK Rock music compares to your US counterparts? I’d say that is up to the crowd. We will put on the best show we can, but I can confirm it will be a close race! Which songs have you found to be crowd pleasers? This genre offers so many but our top five performances have to be- Don’t look back in Anger by Oasis, Hey Jude by The Beatles, Rebel Yell by Billy Idol, Revolution by The Beatles and Whole Lotta Love by Led Zeppelin. How long have you been performing the show, how did the band form? We originally formed as the sister band to the Great American Classic Rock Show, but the show has been so successful and become a talking point in its own right! We are very proud of the setlist and crowd engagement we get from this show. Watch UK Classic Rock Show on our main stage on Saturday, 23 March from 8.30pm.